Saquon Barkley put on a show against the Eagles Week 6. We're almost at the "who cares" portion of the Philadelphia Eagles' 2018 season, at least in regard to looking ahead to how they match up against their upcoming opponents. But, with a win Sunday over the Giants, the Eagles can draw closer to either the Cowboys or Redskins, who play each other on Thanksgiving, so we forge ahead. Last week, after losing Sidney Jones, Avonte Maddox, and Rasul Douglas during their blowout loss to the Saints, the Eagles were forced to put three corners on the field who weren't even on the team a month ago. That went about as expected against Drew Brees and Co. While Eli Manning isn't exactly Brees, the Giants do have a talented set players at wide receiver and tight end in Odell Beckham, Sterling Shepard, and Evan Engram. It is still to be determined who will suit up for the Eagles this Sunday at corner, but if we're being objective, have any of them other than Maddox shown anything to be enthused about this season? Beckham has to be licking his chops. A year after being the No. 1 run defense in the NFL, the Eagles' run defense in 2018 has not been good. They've been especially bad the last two weeks against the Cowboys and Saints, when Ezekiel Elliott burned them for 151 yards on 7.9 yards per carry, and a mix of Mark Ingram and Alvin Kamara rushed 29 times for 180 yards (6.2 YPC) and two TDs. Worse, as Joe Buck points out in the video below, it looks so easy. Week 6 against the Giants, Barkley put on a highlight reel effort, running 13 times for 130 yards and a TD. He also caught 9 passes for 99 yards. 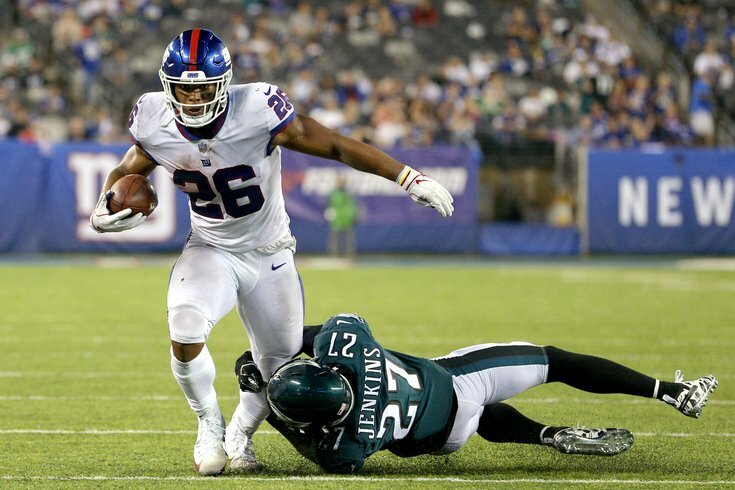 "They're leaning more -- and we probably opened this box -- but leaning more on Barkley not only catching the ball, which he was early on in the season, but running the ball and really pounding it on inside runs," Jim Schwartz said on Tuesday. The Eagles will be without Jordan Hicks on Sunday, which maybe isn't the worst thing, considering they will have to decide whether or not they try to re-sign him this offseason. Perhaps the Eagles' ability (or continued inability) to stop the run against a great back could serve as an informational piece to that puzzle. The Giants' offensive line remains a mess, and after losing two starters (Greco to injury, and Omameh to poor play), they remain short on continuity. In theory, the Eagles' defensive line should feast, but even they have not been effective recently. Perhaps the return of Timmy Jernigan to the lineup will help. Against the Saints, Wentz had his worst game as an Eagle. 19 of 33 for 156, no TD, and three picks. He needs to forget about that performance, play well, and put it in the past, or the mouth-breathers are going to start calling for Nick Foles. And nobody needs that. It will be interesting to see how he responds. BUT... The one game in which they scored 14 in the first quarter was against the Giants (bolded above), and hey (! ), that game looked more like the 2017 season than any of the others. In my opinion, the Eagles should put together a good game plan that they execute well, resulting in points in the first quarter. #Analysis.